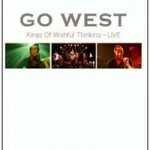 GO WEST-PETER COX and RICHARD DRUMMIE. Between 1985 and 1993 they notched up in the UK alone 13 Hit singles as well as Hit albums “Go West” and “Bangs And Crashes”. The band is, to this day centred around the song writing partnership of vocalist Peter Cox and multi-instrumentalist Richard Drummie. Peter recently attracted media attention when he became involved in the Hit UK TV show “Reborn In The USA”. The show increased Peter’s (and ultimately Go West’s) profile significantly. During Winter 2003 a sell out concert by GO WEST was recorded especially for DVD release and features no less than 10 of their Hit Singles as well as a new track “Glow” with a bonus feature on the DVD of “Glow-Exclusive Preview” with Peter and Richard being filmed in the studio whilst recording the song. Early 2004 sees an extensive UK tour entitled Tony Hadley vs. Peter Cox and Go West. Peter is also set to release a new album of studio material called “Desert Blooms”. Richard continues to write and produce for new artists as well as composing music for film and TV. There is a real rapport between the band and the crowd which makes all of the intervening time just melt away...Overall this is a DVD that will interest not only new fans who have been brought in by the appearance of Peter Cox on TV but also by those who were fans years ago but somehow lost track of them along the way. At 160 minutes long this is definitely value for money. ...some generous bonus features, including documentary footage and interview material, while American fans will be especially pleased to discover that all three are region-free, meaning they will play on any regular DVD player. All their UK hits were performed during the concert they gave and although I had not listened to this band before it gave me a good feeling watching this professional recorded DVD...a must-have because GO WEST was another typical 80s product and they still sound very strong.